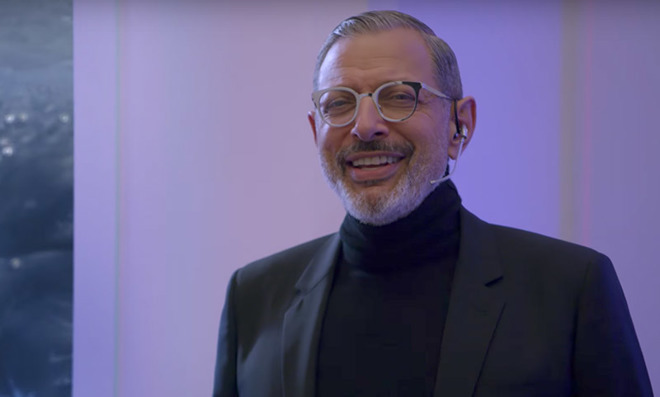 In a recent interview, prolific actor Jeff Goldblum, best known for his work in movies like Jurassic Park and The Fly, revealed Apple cofounder Steve Jobs personally reached out many years ago to be "the voice of Apple." Goldblum's contact with Jobs was mentioned in passing during an interview on the Today Show in Australia, reports ZDNet. "Steve Jobs called me up a few decades ago to be the voice of Apple" Goldblum said. "That was early on, and I did not know it was Steve Jobs." Whether that call came before or after Goldblum's run in a series of late-90s "Think Different" ads marketing iMac and iBook is unclear. Goldblum failed to present a more detailed timeline of events that led up to the phone call, but the actor, who has been in show business since the 70s, hit something of a renaissance in the 90s with roles in the "Jurassic Park" series and "Independence Day." It is possible that Jobs was looking to expand Goldblum's role beyond the ad series. ZDNet speculates Golblum might have made his way into Siri, but Apple purchased the firm behind the virtual assistant in 2010, presumably a decade after the encounter. More likely, Jobs perhaps wanted Goldblum to lend his voice and likeness to campaigns advertising other products, or Apple as a whole. According to the report, Goldblum was in Australia to promote Menulog, a food ordering app similar to DoorDash and Seamless. Interestingly, Goldblum recently channeled his inner Jobs in a fairly long-running commercial series for Apartments.com. In the ads, Goldblum plays the role of quirky futurist "Brad Bellflower," who always wears black turtlenecks (with jacket) and a head-mounted microphone while helping apartment owners and renters find each other through the company's matchmaking service.